We’re going old school today. I had no idea I’d hit the jackpot when I grabbed this three buck retro Slinky off the shelf at Target. The kids went nuts. They put their Nintendo DS games down and all fought for the right to play with a today from the 1940’s. I showed them how to make it walk down the stairs. They thought that was cool even if it only descended three stairs. I love the sound the Slinky makes and how it squirms back and forth in my hands. I showed the kids how to slowly move their hands up and down to make it flow just right. “Looks like a water bubble” chimed Luca so I used that description to help them move it from one hand to the other. Sorry Sonic. Sorry Mario. Sorry Zelda. At least for today, you’ve all been schooled by the Slinky. Awesome!!! 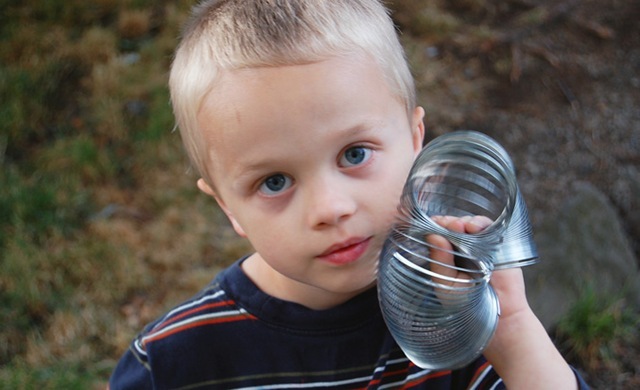 We have gone through countless slinkies in our home over the years. The boys love stretching them out to see how far the will go or make waves with them. Doesn’t take long before it’s a tangled mess. But yet I give in from timt to time and buy another one.